Every woman has always envisioned the wedding day since she had learned about romance and love. It is simply a long-time dream; a really big and whimsical one, so much so that when it is actually approaching, you just want everything to be perfect. To get the best lingerie for you gorgeous wedding dress, just browse through our wedding corset section. Beyond questions, wedding corsets make for divine-looking brides, which accentuate the bust and hips and ultimately give you a flattering figure, making you look incredibly beautiful in all aspects on your special day when you really deserve to be a queen. 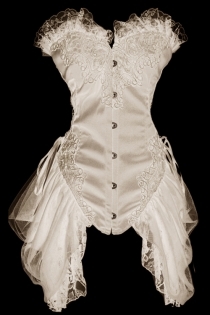 Wedding corset could be worn either under the actual gown or as part of the ensemble with a matching trailing skirt. 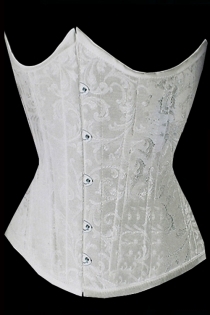 Our beautiful collection of bridal corsets comes in various styles and designs. Since the primary purpose of a wedding corset is to mould the body into a desirable figure and put emphasis to the mid-section, you may opt to use a simpler and more basic corset that will serve as an enhancement, which is to be worn beneath your actual gown. 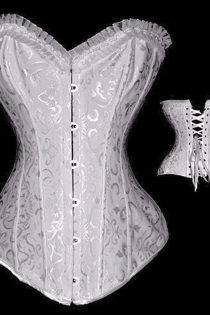 If you decide to pick a bridal corset however according to its design, then it could be a standalone and be paired with a skirt or be connected to it. Each one of our wedding corsets was tastefully made with the wedding proper in mind and how stunning you would look in it and make you the goddess of your most special day. Besides, elegant and classic accessories such as the veil, pearl or diamond jewellery and even the garter to be worn on the leg, should be carefully and thoughtfully picked out. As a finish to your ravishing look, it is imperative to pick out heels that would complement the embellishments of your gown. We found 41 items for your choices.